Where Are You Birding This Second Weekend of June 2008? Is migration over already? Well, not completely but a lot of birds have hunkered down. One one side of the Earth, we’ve got winter birds while on the other side, we’re watching resident breeders… those chicks grow up so quickly, don’t they? So where are you going birding this weekend? Comment below on the excitement you have planned! Corey and I are escaping to the island, Long Island that is, in search of groovy goatsuckers like Whip-poor-wills and Chuck-will’s-widows. I expect we’ll see quite a bit more than that too. Where will Charlie be? One of the great things about our great friend is that he can turn up just about anywhere British Airways flies, so keep you eyes out! This vulture is elegant in the sky! We see many of his kin around here. He is strangely beautiful. I am never in the right place to catch one of these and if I did or was, I would have to crop the dickens out of it to be close enough to see the detail you can see in this photo. You must have a 500mm lens or something. Nice photography. Very nice. Thanks SC and AL. I actually shoot only 300mm but this TV, in the skies over Arrowhead Marsh in Oakland, CA, swooped nice and close. 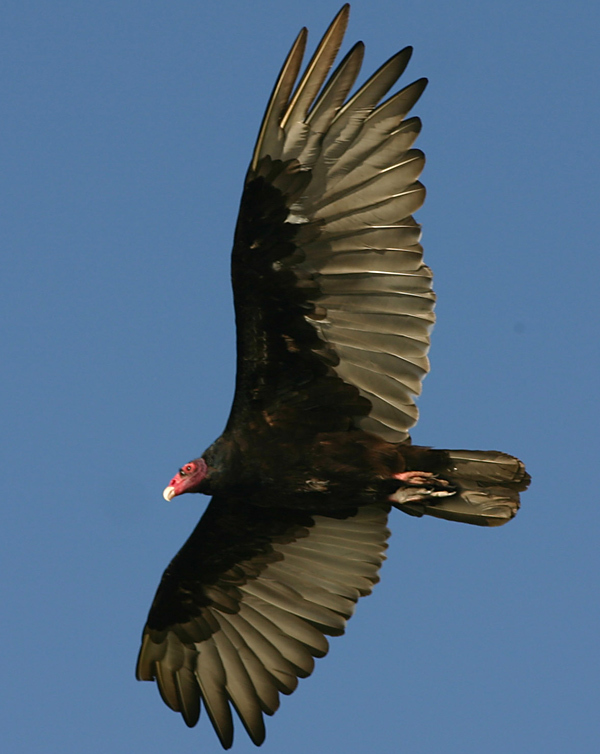 Gorgeous shot of the turkey vulture! I have about 50-60 turkey and black vultures roosting in the trees within sight of my house. They are here year around and all hang out together. I love watching them soar over my house. Wow…nothing like that fella here. Thanks for sharing him. I’ve been asking myself this same question all week. I may try the marshy or forested areas of western Middlesex county in Ontario early Saturday morning, and then head down to the north shores of Lake Erie for the afternoon. Local reports are thin on the ground, so I don’t know what I’ll find… part of the fun, I suppose. Lovely portrait of a TV. Remarkably, I have one of my own that is almost a feather-for feather duplicate. It’s June 14 and I’m heading up Slide Mountain in Ulster County NY to look for some Bicknell’s Thrushes and breeding warblers! I have done this trip a few times and each time I have seen/heard multiple Bicknell’s Thrushes. I usually see a Ruffed Grouse as well. Tomorrow I’m going to Sharon Springs NY to try to see Henslow’s Sparrows and Clay-colored Sparrows. Chrissy, you should skip Sharon Springs (I haven’t heard of those birds being reported there this year, though, if you do go get up to Ames as well and try to find Upland Sandpipers) and get to Fort Edward where a singing Dickcissel was reported within the last couple of days. Wonderful photo and this is the best time of the year to be out birding! That TV picture is a brilliant capture. Everything about that image looks just right! I missed this post to comment regarding the weekend you meant. I know where I will go birding in the next weekend though. It is to the Peak Wilderness Sanctuary when I will attempt to climb the Adam’s Peak (2,243m), IF I can muster enough strength and stay focussed without getting distracted by every critter around. The fun part is experiencing different birds as you come across 3-types of altitudinally graded rain forests, if you are man enough to do the full monty. I will be out at Lake Louisa State Park in Central Florida. For both Birds and Butterflies/Dragonflies. I DID see a Henslow’s Sparrow and a Grasshopper Sparrow and a Clay-colored Sparrow in Sharon Springs, NY. My hike up Slide was good and we heard about 6 different Bicknell’s Thrushes but didn’t see an adult. We did see a fledgling however, which was great! Also had great looks at Blackburnian Warblers and heard Ruffed Grouse drumming!